In the Sims 3, meditation requires visiting China and learning Martial Arts. In real life, you can easily learn it from the Internet (link with sound). On the other hand, the floating and trippy colors are subjective at best. 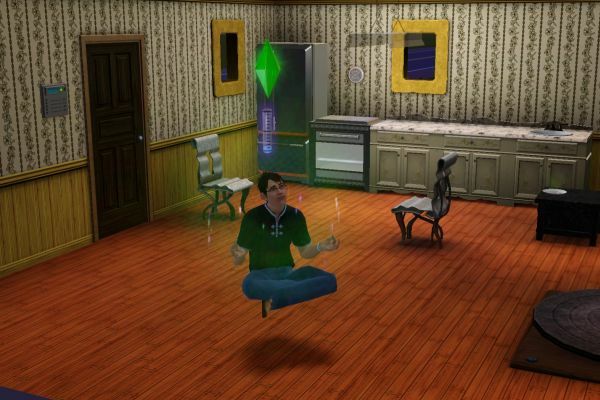 I guess there are not many people who meditate and play the Sims 3. Â The two don’t quite exclude each other, but they largely appeal to different types of people. Meditation calms and quiets the mind, while computer games tend to excite. Â (WithÂ the Sims 3, that depends a bit on your play style, I guess.) Games tend to be an escape from the real world, while meditation is a grounding in something even more real than the manifest world. So they are quite a bit apart. In light of that, I find it a bit amusing that meditation in this game has become quite a bit more realistic than before. In the Sims 2, meditation was unlocked by the Logic skill (usually at level 4), and basically froze your sim’s motives – you did not get more hungry or tired etc, as if time had stopped for you. For your sim, I mean. After a long time spent in continuous meditation, you would start floating in the air and be able to teleport. Â Not exactly a fast way to travel, since it took the day to get that far. In the Sims 3 meditation is much more realistic, although there is still the floating and teleportation at the end, which is (in my experience at least) not realistic at all. (I hear some people feel like they are floating, but that is pretty much it.) For the rest, though, the skill has become more realistic. I am not sure tying it to the Martial Arts skill was a good idea, it could have been a separate skill. But I guess it beats logic as a starting point. Anyway, you now grow hungry and your bladder fills up etc much like you were just sitting there. The only thing that happens right from the start is that you start building up “meditative focus”. This focus lasts for a while after you end your session, and improves the quality of your work and the speed of your learning. Fittingly, it evaporates if you use the “magical” ability to teleport. Â Magic is not the best use of meditation, after all. Once you have spent a long time in meditation – not hours, but a noticeable part of a normal lifespan – you become a master of meditation. I am not 100% sure this is a feature rather than a bug, but it seems the meditative focus now becomes permanent. It says 15 minutes left, but it has said so for half a generation now. If that is intentional, it is actually a pretty good approximation of real life. If you do keep it up for many years, meditation will really change you and make you better able to live your life, learning things and doing things better. Â Quite apart from any mysterious or seemingly magical experiences you may or may not encounter along the way. This entry was posted in games, human mind and tagged meditation, Sims 3 by itlandm. Bookmark the permalink.